Blocking a keyhole from locking or unlocking may be important for safety. You can temporarily or permanently block a keyhole, depending on your needs. If some unwanted person has a key to your residence, you might temporarily block a keyhole until you can replace the lock. Permanently blocking a keyhole, meanwhile, will prevent everybody from inserting a key to lock or unlock the door. 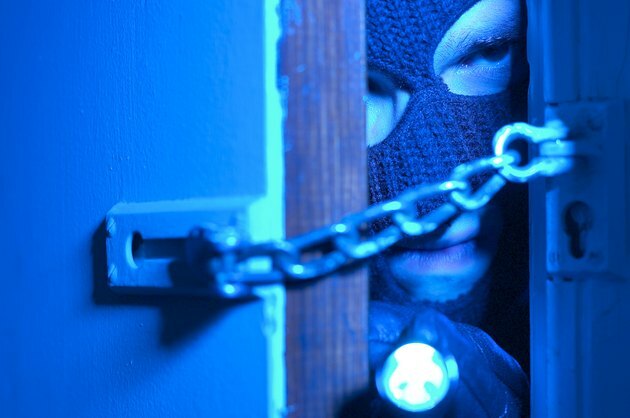 Prevent potential burglars from unlocking your door. Shut and lock your door from the outside. Slide a keyhole lock into the keyhole. Insert the keyhole lock key into the keyhole lock. Twist the key to fasten the metal lock pins into place. Remove the keyhole lock key. The keyhole lock remains in place and prevents unwanted visitors who may have keys to your residence from entering. Purchase a keyhole lock at your local home-supply store. Reinsert the keyhole lock key to open and remove the keyhole lock. Clump together a handful of toothpicks -- the amount of toothpicks will depend on the size of your keyhole. Shut and lock the door whose keyhole you'd like to permanently block. Be sure you have another entrance to the residence. Insert the toothpicks into the keyhole. Break the toothpicks off. The toothpick ends left in the keyhole will prevent a key from being inserted. Fill a keyhole you wish to permanently block with caulk. Scrape off any extraneous caulk with a putty knife. Allow one hour for the caulk to dry. Apply one layer of permanent epoxy over the keyhole.